There is substantial evidence correlating positive customer experience with business growth. Most customers spend more as a result of a positive customer experience, and more than half of customers who recommend a brand do so because of the customer experience (versus other factors, such as price or product), research has found. However, many companies fail to deliver excellent customer experience. Yet, poor customer experience drives brand switching—typically a key reason for three quarters of lost customers. And most customers who suffer a bad customer experience spread negative word-of-mouth. Recent research* conducted by B2B International found that only 14% of large B2B organizations are truly customer-centric—i.e., the customer experience is ingrained in the fabric of the company. That finding indicates that B2B companies have significant work to do to become more customer-focused, but it also suggests a huge opportunity for B2B firms to differentiate their brands by delivering a superior customer experience. 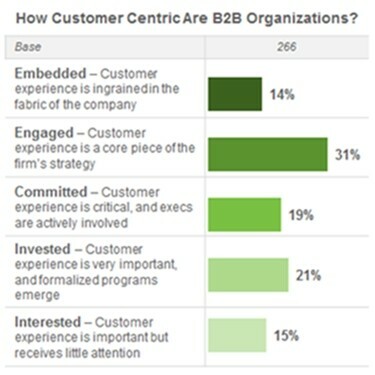 So, what do B2B firms need to do to deliver a differentiated customer experience?